Choosing the right shopping cart is a critical e-commerce development decision and not at all an easy one. There are so many variables involved that can make this technical decision a daunting task. On the market, there are plenty of shopping carts you can choose from and many of them are great tools. Among the best options, you will find Drupal Shopping Cart, Magento, and PrestaShop (official provider). However, even an excellent tool may not be the best pick for your e-commerce development unless you have a clear marketing plan in mind. Drupal, Magento, and PrestaShop are all high performing shopping carts but differ when it comes to specific features, customization, and scalability. To assist you in your e-commerce development process we have summarized the main advantages and disadvantages of these three top-notch shopping carts. Drupal is an open-source extension of Drupal CMS and is a popular solution adopted by many online stores. It does require some technical expertise to be managed but can be suitable even for large e-commerce. Magento is known to be the leading open-source shopping cart. However, it is not for inexperienced users, and unless you have programming skills/you will need a developer to customize it to make your online shop look great. On the other hand, the potentialities of Magento are impressive therefore it is a recommended choice especially for large sites. Prestashop is another open-source shopping cart. It is simple to use and customize even for newbies. In just a few steps your online shop can be up and running. PrestaShop works well for small to medium e-commerce. Drupal is a very flexible shopping cart. There are several modules available that you can add at any time. You can use them to refine the look of your online shop and its functionalities. Even though Drupal Commerce is fairly easy to customize, some expertise is required if you want your e-commerce to look stunning. Magento can be customized exactly how you like to make it look great for your branding. With this shopping cart, the sky is the limit. However, to achieve the best result, a high level of programming skills are required. Without those skills, you will no doubt find it very difficult to work with Magento and the result will be high levels of frustration and low levels of productivity without the desired results. Prestashop is the easiest platform to customize among the three. Even if web design is not your strength, you should be able to make your online shop look appealing thanks to the many templates available. Drupal is a robust shopping cart that can assist you during your e-commerce development. As your business evolves and expands, Drupal offers several solutions to accompany you along the journey. Even in the case that you start from a small to medium online shop, you can always expand and implement Drupal Commerce's functionalities to handle higher traffic volumes and customers. Magento is the perfect solution if your marketing plan is to establish a large e-commerce. If you need to handle massive amounts of traffic, a lot of products in different categories, targeted sales behavior and more, whether now or in the future, Magento is the best option among the three. Prestashop can be developed to handle even large online shops. However, if you intend to keep expanding your business or if you foresee a need to change your marketing plans significantly in the future, it would be advisable to consider a more flexible shopping cart like Magento. Drupal, Magento, and Prestashop are all very well designed for SEO purpose. Despite the solution you adopt for your e-commerce development, search engines will welcome your shopping cart. However, among the three, Magento offers SEO features not found in the other shopping carts so we can deem it as the best option for SEO. As we already mentioned, Drupal is a shopping cart that requires a learning curve. Many users can customize and maintain Drupal Commerce by themselves, but if you want to take your online shop to the next level, chances are you may need help. Being an open source and a popular shopping cart, you can easily find Drupal developers which can help keep your maintenance cost within an average range. Magento, on the other hand, requires good programming skills and rarely can you maintain your e-commerce without some help. For that reason, you may need somebody in your team handling Magento's maintenance on a regular basis. Therefore, maintenance costs for this shopping cart are above average. Prestashop is ideal if you want to keep your maintenance cost down. The shopping cart has been designed to be user-friendly so even those with limited experience will be able to learn and maintain it without external help. Drupal Commerce is the engine behind countless online shops. It is suitable for both individuals and corporations. The customization options are somewhat more limited compared to Magento, but it is easier to set up your e-commerce. Drupal Commerce is a great choice if you want to build an appealing online shop without investing a considerable amount of money. Magento works very well for large businesses and enterprises. If you are targeting high traffic volumes and have money to invest, Magento is the ideal tool to create a stunning e-commerce. Prestashop is a shopping cart that you can use to setup your e-commerce in no time and with a low budget. If you expect your online shop to be small or medium, you will love Prestashop. 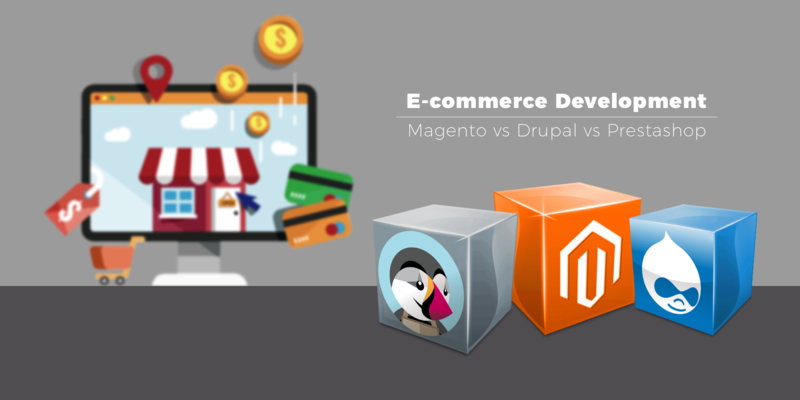 Drupal Commerce, Magento, and Prestashop are all excellent shopping carts. Even though they have several common features, each one of them has unique characteristics that you have to evaluate before making your final choice. If your goal is to create a successful e-commerce development you cannot leave the decision solely in the hands of your web developer. Only you know what your marketing plan is, and if the decision is not in line with that plan, then you will be the one that has to pay the price of switching systems. QPSoftware can develop e-commerce based on Drupal Commerce, Magento or Prestashop. We can assist you in evaluating pros and cons of each shopping cart and determine which one is more suitable for your business. We can customize your e-commerce to match your branding and create the best tool to expand your business online. Contact us today and together will give your e-commerce development a successful start.